The Staedtler triplus fineliner 334 has an ergonomic triangular shape for relaxed and easy writing. The fineliner is dry safe which means it can be left uncapped for days without drying up. The water-based ink washes out of many textiles. It has a superfine metal-clad tip and a linewidth of approximately 0.3 mm. The stand-up Staedtler box makes it ideal for school and office use. 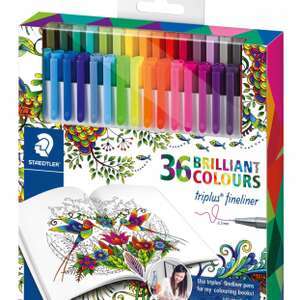 Good price for 36 staedtler fineliners. My 12 yr old saw these and desperately wants them. I'm sure I had to make do with dried out felt tips with nibs that pushed in easily when I was a kid. My 12 yr old saw these and desperately wants them. I'm sure I had to make …My 12 yr old saw these and desperately wants them. I'm sure I had to make do with dried out felt tips with nibs that pushed in easily when I was a kid. Did you ever try to dip the nibs in water to see if they could be stretched out a little further? Or take out the cartridge and put a few drops on that to see if it worked!!! I did! Did you ever try to dip the nibs in water to see if they could be …Did you ever try to dip the nibs in water to see if they could be stretched out a little further? Or take out the cartridge and put a few drops on that to see if it worked!!! I did! I think I just used to lick them ,lol. I was a disgusting child.